A series of post ministerial conferences between the Association of Southeast Asian Nations (ASEAN) and its 10 dialogue partners took place in Hanoi on July 22. The dialogue partners include China, Japan, the Republic of Korea, India, Australia, New Zealand, Russia, the EU, the US and Canada. At these meetings, the ASEAN Foreign Ministers and their counterparts reviewed relationships in the past year and set forth ways and means to promote future cooperation. The main agendas of the meetings included strengthening effective, substantive and comprehensive cooperation between ASEAN and its dialogue partners, from assistance to ASEAN in realizing its community-building goal and promoting connectivity to addressing the emerging challenges such as climate change, natural disasters, epidemics and maritime security. The meetings also discussed preparations for the important related summits to be held at the end of this year and exchanged views on strengthening regional cooperation, including the possibility of wider participation and deeper engagement of dialogue partners in the process of shaping the regional architecture. The dialogue partners reaffirmed their support for ASEAN’s central role in the region and shared the bloc’s common vision of a future regional architecture that will be multi-level, mutually-supportive, and being built upon existing mechanisms. ASEAN welcomed Russia and the US’s expressed interest in engaging deeper with the evolving regional architecture, including the participation in the East Asia Summit (EAS) as members with appropriate arrangement and timing. At the ASEAN Post Ministerial Conference with China, the two sides agreed to hasten the drafting of a new Plan of Action to implement the Joint Declaration on ASEAN-China Strategic Partnership for Peace and Prosperity for the 2011-2015 period to be submitted to the 13th ASEAN-China Summit for adoption. The two sides will realize the initiatives for bilateral cooperation, including infrastructure, energy and ICT as well as the use of China-assisted funds namely the China-ASEAN Investment Cooperation Fund worth 10 billion USD and the Credit Fund for Commercial Exchange of 15 billion USD. They will continue enhancing cooperation for peace, stability and prosperity in the region, including cooperation within the framework of ASEAN+3, EAS, ARF and in implementing the Declaration on the Conduct of Parties in the South China Sea (DOC). They also agreed to recommend the commemoration of the 20th anniversary of the ASEAN-China Dialogue Relations throughout the year of 2011. At the ASEAN Post Ministerial Conference with Russia, the ministers welcomed good progress in implementing the ASEAN-Russia Comprehensive Programme of Action to promote cooperation for 2005-2015. They discussed preparations for the 2nd ASEAN-Russia Summit that will be held later this year, including recommendation for a draft statement, convening of the Russia-ASEAN Business Forum and the ASEAN-Russia Cultural Cooperation Agreement. They also discussed and agreed on specific activities in preparation for the commemoration of the 15th anniversary of ASEAN-Russia Dialogue Relations, including the holding of Days of Russian Culture in ASEAN member countries. ASEAN welcomed the establishment of a US Mission to ASEAN in Jakarta . ASEAN and the US agreed to work closely toward the convening of the 2nd ASEAN-US Leaders’ Meeting to be held later in the year. Japan reaffirmed its continued support to ASEAN Community building efforts, including narrowing development gap through contribution to the ASEAN-Japan Integration Fund and offered to provide 800 million JPY assisting the implementation of the Master Plan on ASEAN Connectivity. ASEAN and Japan committed for the early entry into force and effective implementation of the ASEAN-Japan Comprehensive Economic Partnership (AJCEP). At the ASEAN Post Ministerial Meeting with the Republic of Korea (RoK), the ministers agreed to work closely for the effective implementation of ASEAN-RoK FTA agreement with a view to increasing two-way trade volume to 150 billion USD by 2015. ASEAN and the RoK agreed to submit the proposal to elevate the ASEAN-RoK Dialogue Relations to Strategic Partnership, and a draft Joint Declaration on ASEAN-RoK Strategic Partnership to the Leaders at the forthcoming ASEAN-RoK Summit in Hanoi later this year. ASEAN expressed its appreciation to the RoK for inviting Vietnam, as the Chair of ASEAN, to attend the G-20 Summit in Seoul this November. On this occasion, ASEAN extended deep sympathy and condolences to the Government and people of the RoK for the loss of lives resulting from the sinking of the Cheonan ship and called on all parties concerned to exercise utmost self-restraint and resolve all differences by peaceful means. At the ASEAN Post Ministerial Conference with India, the two sides adopted the Plan of Action to implement the ASEAN-India Partnership for Peace, Progress and Prosperity for 2010-2015 and agreed to strengthen cooperation in trade-economics, science and technology, ICT and environment as well as in response to challenges like terrorism, transnational crimes. The ministers tasked their officials to initiate projects to be sponsored under the ASEAN-India Green Fund and the ASEAN-India Science and Technology Development Fund. The two sides discussed preparations for the 20th Anniversary of the ASEAN-India Dialogue Relationship in 2012. At ASEAN Post Ministerial Conference with Australia, t he two sides emphasized the significance and importance of effectively implementing the ASEAN-Australia-New Zealand FTA (AANZFTA) which entered into force early this year. They agreed to accelerate the implementation of the Plan of Action to realize the ASEAN-Australia Enhanced Partnership with focus on areas of education, trade and investment, transport, sustainable use of resources, disaster management, culture and people-to-people exchange. ASEAN and Australia agreed to convene an ASEAN-Australia Summit on the sideline of the 17th ASEAN Summit in the second half of 2010 to give strong impetus to the dialogue relations. At the ASEAN Post Ministerial Conference with New Zealand, the ministers adopted the ASEAN-New Zealand Joint Declaration on Enhanced Partnership for 2010-2015, focusing on cooperation in education, culture and people-to-people exchange. ASEAN welcomed New Zealand’s new proposals for cooperation, including a 54 million USD support for ASEAN students to be trained in New Zealand in the next 3 years. The two sides appreciated the significance and importance of effectively carrying out the AANZFTA. They also agreed to convene the ASEAN-New Zealand Commemorative Summit back-to-back with the 17th ASEAN Summit in Hanoi. At the ASEAN Post Ministerial Conference with Canada, t he ministers adopted the Plan of Action to implement the Declaration on ASEAN-Canada Enhanced Partnership for 2011-2015 and agreed to work toward an ASEAN-Canada Trade and Investment Framework Agreement (TIFA) to enhance trade and investment relations. ASEAN welcomed Canada’s signing of the Instrument of Accession to the Treaty of Amity and Cooperation (TAC), which marks another significant progress in the dialogue relationship as well as Canada’s commitment to peace, stability and cooperation in the region. At the ASEAN Post Ministerial Conference with the EU, the two sides agreed to promote the implementation of programmes and activities to realize the ASEAN-EU Enhanced Partnership, especially boosting region-to-region economic cooperation. ASEAN appreciated the EU’s determination to accede to the TAC in Southeast Asia and informed the EU of the signing of the 3 rd Protocol amending the TAC to be held on July 23 which would pave the way for the EU’s accession to the TAC at an early stage. 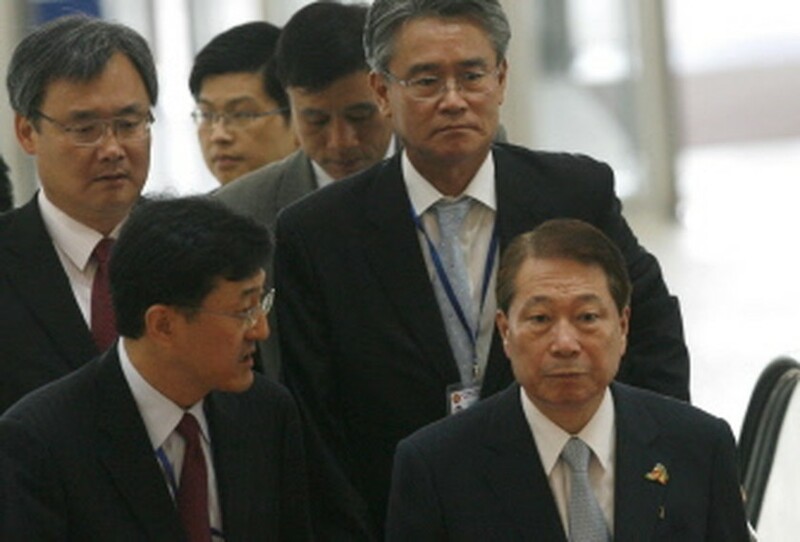 South Korea's Foreign Minister Yu Myung-hwan (R) listen to his aides as he arrives at the National Convention Center for ASEAN Regional Forum (ARF) in Hanoi on July 22, 2010, which takes place from July 19 to 23.